Quite some time ago, I picked up a large batch of acetates from some online seller. They were the usual mish-mash of home recordings, audio letters, recordings off the radio, etc. But two of the records, one recorded on both sides, the other on one side, contained a curious recording of a radio program which aired on the legendary WGN on October 27, 1946, as part of a 15 minute series called "Distinguished Guest", sponsored by one of the Department Store giants of the Chicago area, then and now, Carson, Pirie Scott and Company. The episode I have is primarily given over to a speech by "His Holiness, Patriarch of the East and of the Assyrians", Mar Eshai Shimun. Reading up on Shimun, beyond his brief Wikipedia entry, provided quite an education, and I encourage those interested to do so, as well. He took over his position at age 11, and saw his people and their lands go through extensive changes and upheavals during his lifetime. By the time of his recording, it appears that he was living in Chicago. He seems to have been viewed as a great man by some of his people, and nothing short of evil by others, at least by the point of his assassination, nearly 30 years after this recording was made. Reading up on him gives a bit of background to what is already (to me, at least) a very interesting speech heard here. As interesting as this recording is, I do wish I had a copy of the speech from the following week, by Arkansas' then-Governor, Ellis Arnall, who seems to have been just as interesting a character. The grind I like, I really love, perhaps because as a genre, there is rampant saminess; so I sit back and let bands like Psychic Limb, Ubasute, Agathocles, Cattle Decapitation and Pig Destroyer rise to the top by way of their own virtues. Alex Caprio's distinctive and unpredictable shriek, Mike Marciano's artful, intricate Rickenbacker bass virtousity, and Jeremy Suria's guitar work (equal parts technical, Steve Howe-midrangery, and thick, power-chord glue) all work thorughly together to make the band a cut above the raging pack. Upon even deeper observation, Ubasute's lyrical content, and carefully chosen graphic imagery foil the more-easily-attained / co-opted genre conventions. Just listen, really listen, to this outstanding set, marking the MCoQ show's return to live music in February, and you'll hear and feel the urgency, raw emotion, and world-attrition in the band's musical mainfesto. Many thanks must go to engineer Ernie Indradat, whose talents are ready seemingly for whatever musical challenges confront him, and to Tracy Widdess of Brutal Knitting, who once again, wove my slap-dash band capture into an excellent portrait of Ubasute, right down to the apropos color-palette for the band's carefully (and unpretentiously) crafted graphic universe. Today, a follow-up. Two weeks ago, I wrote an entry about "The Most Unusual Voice I've Ever Heard on an Audio Letter"
Being currently unable to accept comments to this site, I invited comments about these mysterious tapes to my own e-mail address, and was happy to hear from more than a half-dozen commenters. Many suggested that the person speaking had undergone a tracheostomy. I was previously only familiar with the machine used by people with this impairment, which makes sort of a burping, low toned vocal sound, but I guess the sound on these recordings is an earlier method of assisting someone who has had this procedure to be able to speak. But one intrepid writer went much further, and by searching for the return address on the tapes, and then for the name that site turned up, found something truly amazing, and equally horrifying. Remember that the sender of the tapes, and presumably the primary person talking, was listed as A. Mere at 180 Mere Rd. in Leicester, England. Using that information, this led my researching correspondent to a site which indicates that the person at that address, Mr. Ain Mere, was an Estonian who retired to England, and who was a collaborator with the SS during World War II. Here is the first site found. That led both my correspondent and me to check Wikipedia, and we came up with even more information - which you can see here - that after retiring to England he was accused and convicted of war crimes, by a Russian court, and sentenced to death. As the page goes on to say, due to lack of evidence, English authorities refused to extradite him. Several writers, intrigued by what is on these tapes, have asked where I got them. While I don't keep close records of where I've come to own most of the myriad tapes in my collection, there is really only one place I would have acquired a large collection of tapes sent from one person to another, and that is eBay. When and from where the seller was located, at this point I haven't a clue. But this is just another reminder that you literally can never know exactly what's going to come out of the speakers on the next reel of tape you spool up. And why I'll be continuing to explore this amazing world of sound for the rest of my days. And now, for your dining and dancing pleasure, here's another one of Ain Mere's tapes, featuring the dulcet tones of Mr. Mere. 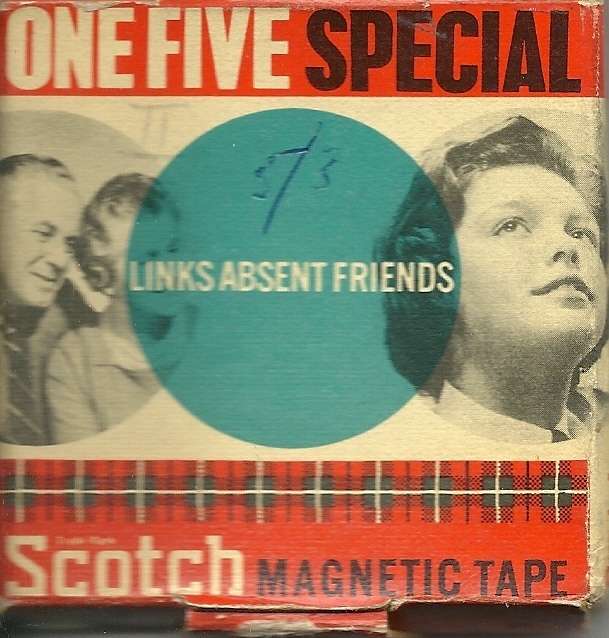 On this tape, the other person who appears on these tapes (a younger woman, I'm guessing) speaks about as much as the sender does, which is unusual for these tapes. She even briefly lapses into English a couple of times. What occurred to me, while digitizing this tape, is that there are few things that have less in common with the allegations against Ain Mere than the do either the joyful sound of the early Beatles or the good cheer found in "She Taught Me to Yodel". Thanks to all who wrote, and many, many thanks to GM in cyberspace for filling in the blanks! Comments still appear to be disabled, so if you'd like to say something, please write to me at the address you can find on this page, and I'll try to add some of those comments to this post, when I get a chance. "The Brush that Could Haunt Men's Souls" and "The Mark of X"
Today we'll diverge a bit from the usual 'music' related comic book stories in this series and look at two tales from the 1950s run of the DC book "House of Mystery" that involve, first, a comic book artist and an art brush, and second, a television writer who discovers an interesting solution to writer's block. "It was only a brush -- an ordinary painter's brush ... but in its soft and yielding bristles was hidden the power to force from men the truth! Lies perished in their hearts ... Falsehoods froze on their lips ... and once their innermost secrets were revealed, found themselves teetering on the very brink of doom!" Thus begins our first thrilling story from House of Mystery #10, January 1953, unfurling for you right after the jump! 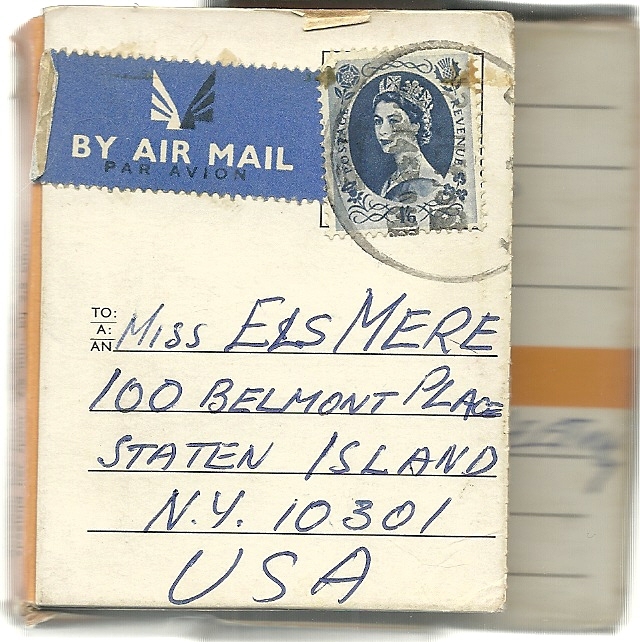 Somewhere along the way in my collecting travels, I picked up a collection of audio letters, recorded and mailed in the mid 1960's, from someone living in England to a family member living on Staten Island. 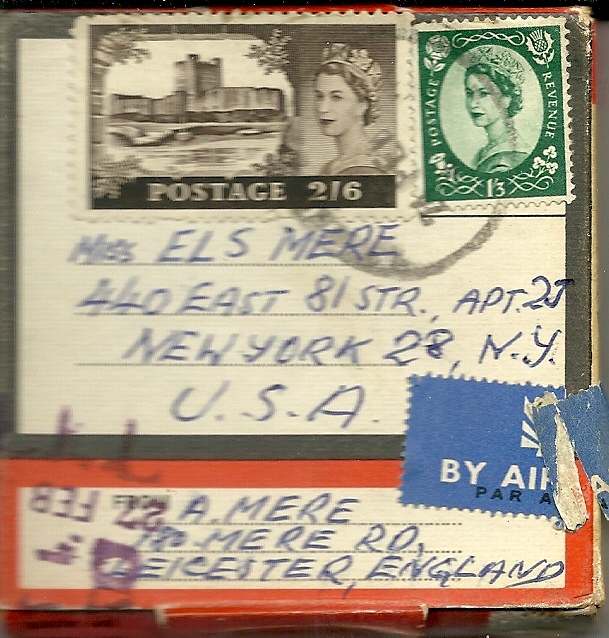 Both share the same last name, and the resident of England even lived on a street which carried her own last name (see scans of the tape boxes, below). 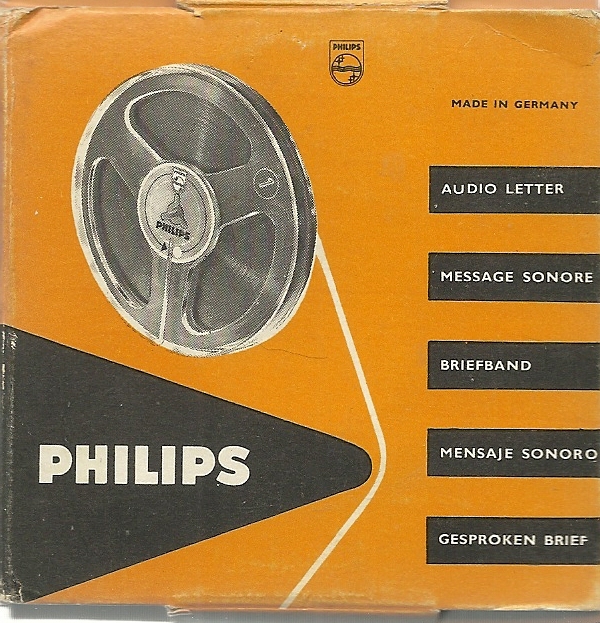 The tapes typically contain conversation from the sender (occasionally there are two voices on the tapes), interspersed about evenly with various pop songs from a variety of countries, languages and styles. And that's where what I know about these tapes end. 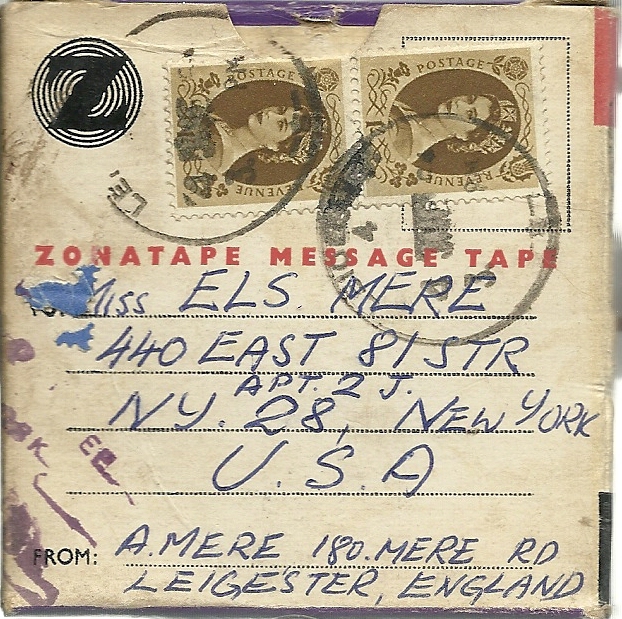 Because the people on the tapes are not speaking English - I don't know what language this is - and the person who does about 90% of the speaking on the tapes has, by far, the most unusual speaking voice that I've ever heard on the hundreds of audio letters I've collected over the years. I don't know if it would sound quite so otherworldly if I understood her language, although I suspect it would. And without knowing the story behind the reason her voice sounded this way, I'm not going to speculate on the reasons for her unusual sound. She sounds quite elderly, but even on that I could be mistaken. These tapes - like the vast majority of audio letters I find - are on 3 inch reels. I've made copies of two of the apes here. 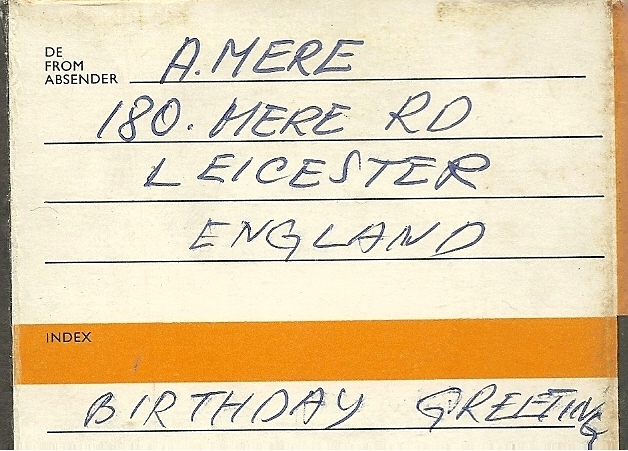 One is labeled "birthday greetings", and the other one says nothing more specific than "rec'd 6/9/64", which is written on an inner flap of the packaging. 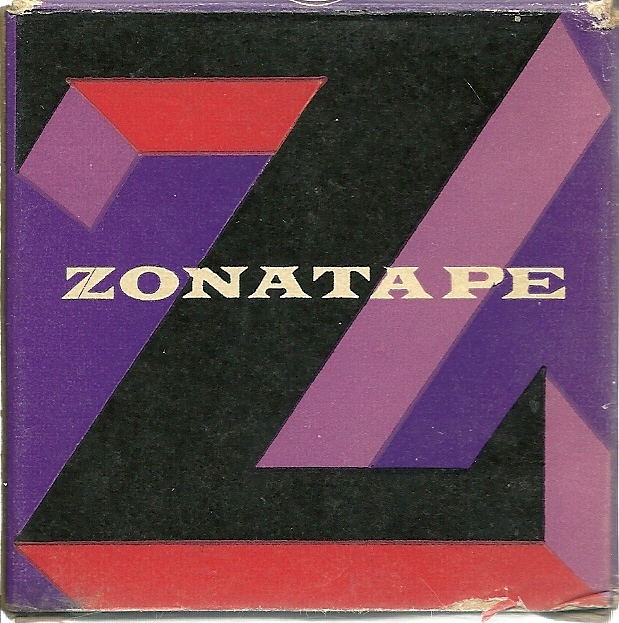 Like most of the tapes, each of these four sides starts with a musical offering. In each case, the tapes alternate between music and talking, with 2-3 minutes of talking in between each 2-3 minute song. The first tape has about 13 minutes to a side, the second one ("Birthday Greetings") only about 7 minutes to a side. The second person I mentioned who also speaks on these tapes, is only heard here, briefly, on the second side of the Birthday Greetings tape, speaking presumably the same language as the primary speaker. I find the variety of the music shared here fairly interesting - while much of it is pop music which I think I'd describe as a "continental" style which I associate with the time period, I do find it interesting that several languages are represented - this person did not limit her tastes in music to her own language. By coincidence, the last song offered up is the German remake of "Memories Are Made of This", sung by Freddie, and retitled "Heimweh", which I shared a few years ago in this post. If anyone wants to offer up information as to what language is being spoken, and even better, some of what's being talked about, I'd be very appreciative! I cannot seem to make the comments to this entry open, so if you want to contact me, please write me via the link on this page. "Shh ... listen ... do you hear it ..? The ghostly strains of lament! That's right, it's "Music by Artie Draw" ! But he's dead! Yes, he's dead ... Yet deep in the night he stalks about, and it's music from the grave you hear! But be at ease ... Grimm, our ghost doctor, is working frantically on this case that is driving Margo, the beautiful songstress, to certain madness ... How does he fare out? ... Read on ..."
While I'm still away on vacation, I've selected a cheerful little feature from the pages of the third issue of Haunted Thrills magazine, October 1952. It's a handsome package put together in the Jerry Iger shop, and aside from that we have no definitive art or writing credits. It's got some very lovely ladies, one of whom is pretty darned evil, and a scary ghost, so it's guaranteed to entertain and educate. Try a little dash of Mayhem with your Music - right after the jump!